I have always been fascinated by maps as a child, and could spend endless hours looking at the globe my parents got me as a present for my 5th birthday. I was so hooked on to it that my parents even considered removing it from my room fearing that it could hamper my social development (and this was in spite of my parents being extremely proud that I could tell most of the countries and their capitals around that time!). Even though maps don’t intrigue me to that level anymore, I still follow them as part of my job and have written quite a number of blogs on getting spatial information in the Microsoft stack, starting from SSRS 2008 R2. 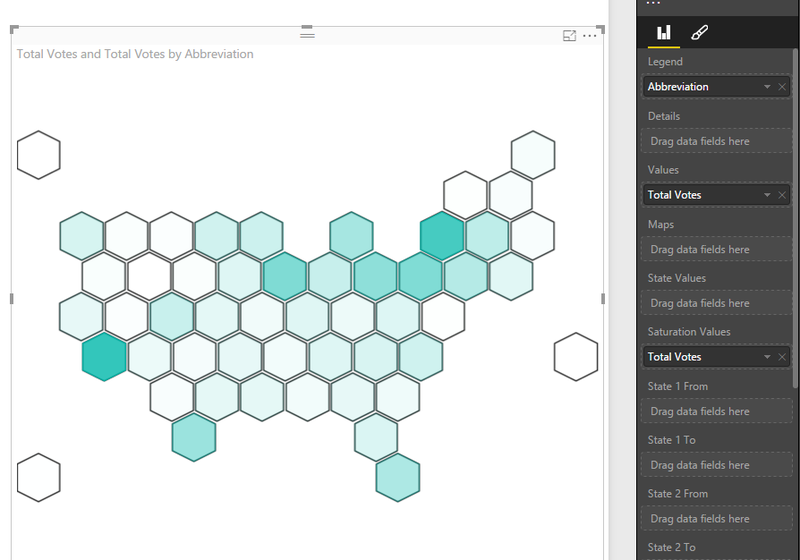 So it was kind of natural that when I saw a couple of hex grid maps floating around my twitter feed a couple of months ago, I thought of reproducing it in Power BI as I knew it could be done. 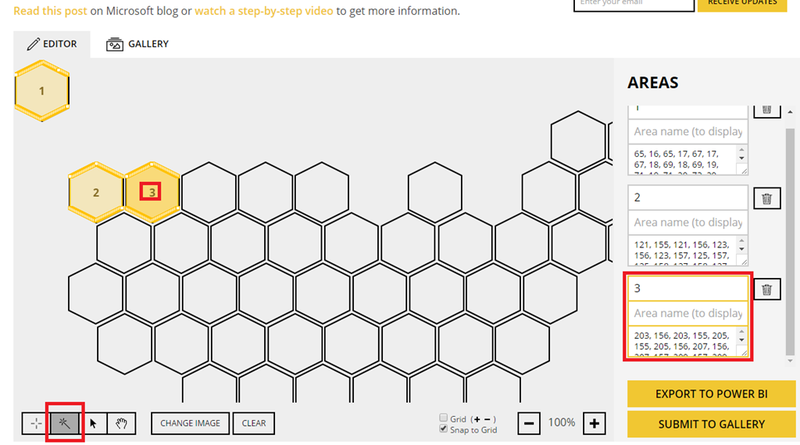 1) Choose a version of the hex tile grid map that you like from the internet. 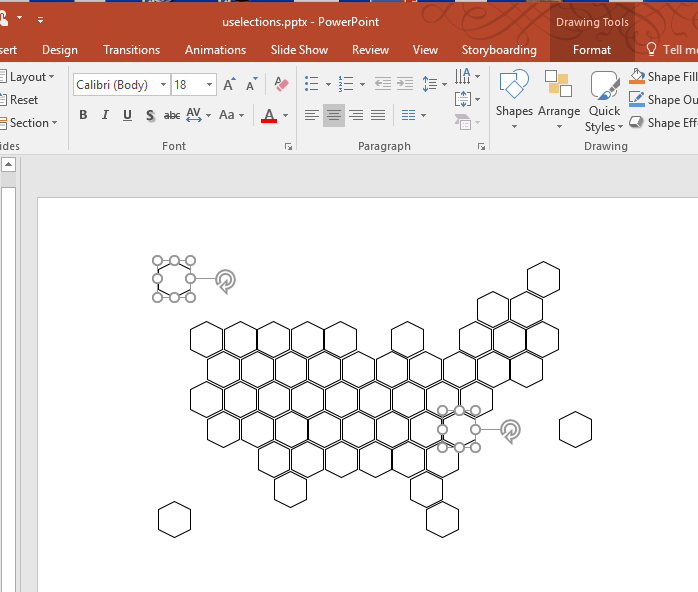 Or you can even make one easily in PowerPoint or any other image processing software (as it is just a collection of hexagons) based on the image that you get from the internet and save it as an image. 2) Go to http://synoptic.design/ and upload the image to the synoptic designer by dragging and dropping the image to the designer. 3) Ensure that the second icon on the bottom left is enabled (which helps us to automatically discover new areas). Now you can just click on the hexagons and the synoptic designer automatically discovers the areas for you, which is super cool. Now, for most people, this should be more than enough and the results come out really good. In my case, I decided to take a step further as I was planning to share the file for the community. If you notice carefully, you can see that more than 6 vertices are being plotted by the designer automatically (check out the multiple vertices in the section I highlighted). To avoid this, I just wrote a bunch of formulas which would calculate the vertices in plain old excel and then just copied the 6 pairs for each of the 51 states manually. Make sure that you map the areas to the appropriate state name / code also. 4) After this, your map is ready and you can just export it to Power BI, which would save the map data as a SVG file in your computer. I would also request that if you make some interesting maps / shapes, please consider submitting it to the gallery so that other community members can also reuse it. I have submitted my map to the gallery and hopefully it will be approved by the SQLBI team (who created and still supports this wonderful tool). 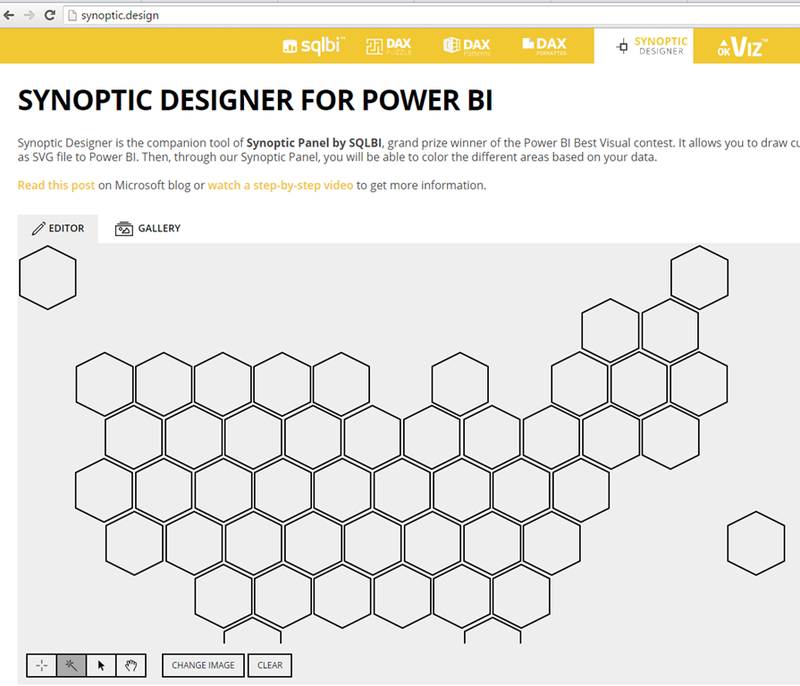 5) Now open Power BI, and download the Synoptic Panel from here (if you don’t already have it) and import to Power BI. 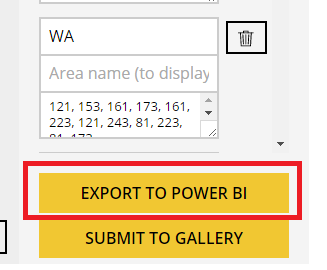 Once you have done that, click on the Synoptic Panel to add it to Power BI, and add the state code (which is the filed we are going to bind our dataset with the map) and a measure (like Total Votes) to it. Then click on the “Select Map” icon. Then browse to the SVG file we just downloaded from Synoptic Designer and you should have your basic version of the hex tile map ready. Feel free to experiment by adding measure values to the Saturation or State values. Now as a reward for making it till here, I thought of letting you play with this simple report that I created using this hex map. In this report, you can select any year from 1916 and see the winning party of each states (I only included the data for Republican and Democratic parties), as well as the nominees of the election. 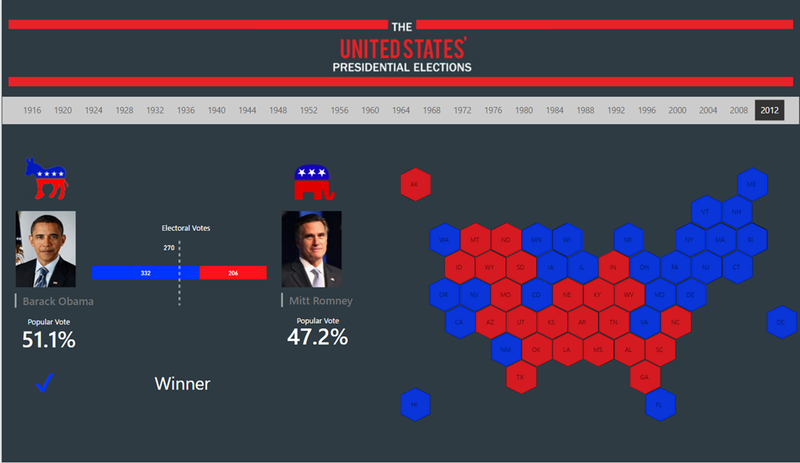 You can also see the number of electoral votes they won along with the popular vote %, which gives some pretty insights. For e.g., it is interesting to see that George W Bush won the election even though he got fewer popular votes than Al Gore in 2000. Click on the Expand icon to see the report in full screen. I was going through some of my old documents and found this article on map reports which I had written for a SSRS book (which didn’t go through because of some time related issues). 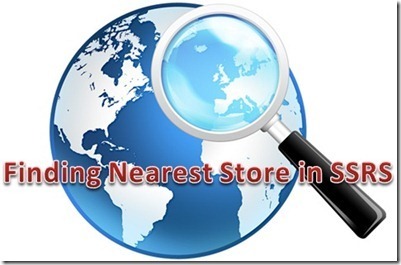 I thought it might be useful to those who are looking to explore map reports in SSRS. So here it goes:- Map reports have been a part of SQL Server Reporting Services from SSRS 2008 R2. However, they are usually a grey box for developers and hence, not been used to their full potential in most of the organizations. This chapter will introduce you to the basic concepts involved in map reports and then take you through some of the common scenarios involved while building map reports. 1) Geometry and Geography: These are the two spatial data types that are available in SQL Server 2008 and above. Geometry imagines that the world is a flat rectangle while Geography takes the curvature of the spherical earth into account. Depending on your application, you can choose between the two data types for your spatial purposes. Geography data types would be more precise over long distances as the earth is actually spherical, but it would require more overhead in setting up the spatial data as additional parameters have to be provided to account for the roundness of the earth. Geometry on the other hand is easier to setup but might not give you the precision over long distances. 2) Source for Map Reports: SSRS 2008 R2 and above allows two main map sources – ESRI Shapefiles and SQL spatial. Shapefiles are a popular geospatial vector data format which can be used in a lot of geographic information softwares. A shapefile will consist of at least 3 mandatory files (of extension .shp, .shx and .dbf) to store core data and might have some other files for improving performance. Apart from shapefiles, the spatial data can be stored in SQL Server database using the data types geography or geometry and used as a source for SSRS map reports. SSRS also has a predefined set of maps in the Map Gallery, which is essentially spatial data embedded in reports and this can also be used as a source for your map reports. 3) Layer Types in Map Reports: There can be 4 types of layers in SSRS Map reports namely Polygon, Line, Point and Bing Map. Polygon layers are used for displaying outlines of areas like administrative boundaries for countries, states, etc. Line layers are used for displaying the lines for routes, roads, paths, etc. Point layers are usually used for displaying the markers for point locations. The Bing Map layer adds a background of Bing Map tiles that correspond to the spatial data available in the map viewport. 1. Start by creating a new report project using SQL Server Data Tools (SSDT). 2. Design a new shared data source based on the Microsoft SQL Server provider that connects to the sample AdventureWorksDW2012 database and name it DS_SQL. 3. Design a new shared data source based on the Microsoft SQL Server Analysis Services provider that connects to the sample AdventureWorks Multidimensional database and name it DS_SSAS. This section will demonstrate how to create a map report from a shapefile and visualize it with the measures present in your relational or multidimensional database. 4. Drag and drop a map report item from the toolbox to open the Map Wizard. In the first screen, select ESRI Shapefile as the source of spatial data. Browse to the folder which has the saved maps for the sample UK shapefiles and select GBR_adm1.shp. Click on Next. 5. You should be able to view the map and change its resolution or crop it in this screen. 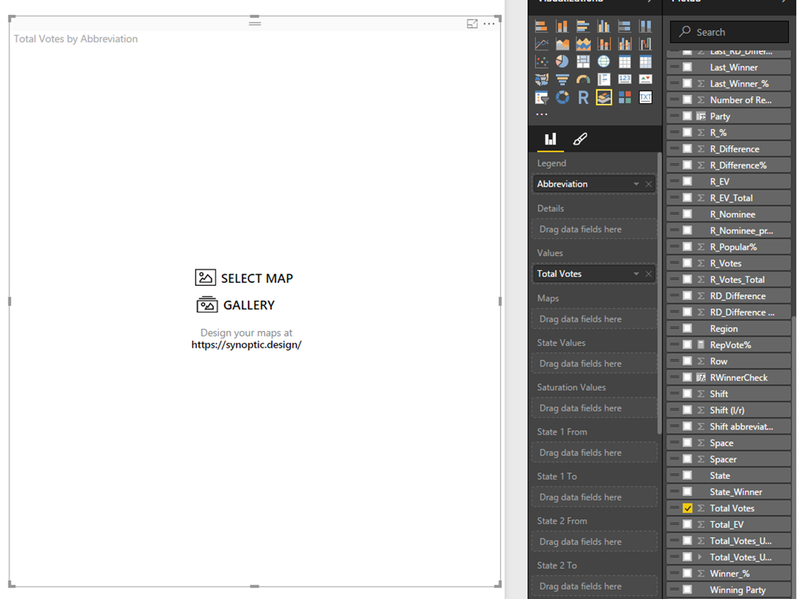 You can also add a Bing Maps layer in this screen if needed. Click on Next. 6. Choose the Map Visualization in this screen. Since we have chosen a polygon shapefile, we get the options for Basic Map (which just displays the map), Color Analytical Map (which visualizes the data by varying color) and Bubble Map (which visualizes the data by bubbles of varying sizes). The last two options would require a dataset for getting the measure information to visualize data. Choose the Color Analytical option for now and click on Next. 7. In the next screen, select the analytical dataset DST_Analytical_UK_C that we had created in Step 3. 8. In this screen, we will have to specify the match fields in the spatial and analytical data. Select the checkbox for NAME_1 in the spatial dataset field and select Country in the dropdown for analytical dataset field. You can see the selected fields getting highlighted in the window panes below. Click on Next. 9. Choose an appropriate theme and select [sum(sales)] from the dropdown list of the Field to visualize option. Choose the Color Rule as Red-Yellow-Green. You can choose to display the labels also if you want. Click on Finish. 10. Now you can preview the report and see your first map report. 1) Why is that some of my map regions are not getting visualized and are being displayed in white color? This is a clear indicator that the names in the match fields for the spatial and analytical data are not the same. An example is present in our current example where DST_Analytical_UK_C has a field value of ‘N Ireland’ while the shapefile has a field value of ‘Northern Ireland’. You can change the value to Northern Ireland in the analytical query but this might not be a valid scenario in most of the cases where the data comes from the Data Warehouse and we would not want to tamper with the Data Warehouse. In such cases, we can change the field value of the shapefile by going to the design mode for the report, right clicking on the polygon region (in this example, Northern Ireland) in the map report item and selecting Embedded Polygon Properties. Now the NAME_1 field can be changed from ‘Northern Ireland’ to ‘N Ireland’ in the popup window and all the regions should be visualized now. 2) Why is it that I am getting a system exception when I try to deploy some of my map reports? This happens normally when you are working with shapefiles in excess of 4MB. By default, the maximum size of a rdl report which can be deployed is 4MB. This can be easily changed by replacing <httpRuntime executionTimeout = “9000” /> with <httpRuntime executionTimeout = “9000” maxRequestLength=”1000000″ /> in the Web.config file which by default is found in C:Program FilesMicrosoft SQL ServerMSRS11.SQL2012Reporting ServicesReportServer. The reporting services might need to be restarted for the change to be reflected. 3) OK, I have succeeded in deploying my report to the ReportServer. However the report takes a long time to render. Why is that? This should come as no wonder if you are working with large shapefiles. Most of the shapefiles that are available online exceed 8MBs and it would be prudent to trim them down the size by changing the resolution in the map wizard. For example, I was able to trim down the size for the current report using this method from 8.5MB to less than a MB without much difference to the map outlines. Another alternative would be to upload the Shapefiles to the ReportServer and then use them as the source for your map reports as is shown in this link http://tinyurl.com/Jason-UploadSHP. This could help in decreasing the rendering time as well as making the shapefiles available for other reports. 4) Why is it that I see only the maps for USA in the Map Gallery? How can I add my own maps there? 5) Where do I find some sample shapefiles to start exploring map reports? There are plenty of sites which offer free shapefiles for at least the country level administrative boundaries. One of them is http://diva-gis.org. For more detailed level shapefiles (like zip codes for Netherlands), you might need to buy it from some vendors or make your own shapefile using tools like ArcGIS. This section will demonstrate how to create a map report from spatial data stored in SQL Server and visualize it with the measures present in your database. 1. Create a new table called dbo.GBR_adm2 in the database which corresponds to the shapefile GBR_adm2 in the sample. (Read the FAQs below on how to import spatial data to the database). Note that the table dbo.GBR_adm2 contains the equivalent spatial data of the GBR_adm2 shapefile in our samples. 6. Drag and drop a map report item from the toolbox to open the Map Wizard. In the first screen, select SQL Server Spatial Query as the source of spatial data. Click on Next. 7. 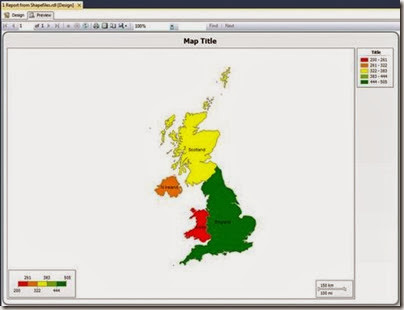 Choose DST_Spatial_UK_D as the spatial dataset in the screen and click on Next. 8. You should be able to view the map and change its resolution or crop it in this screen. You can also add a Bing Maps layer in this screen if needed. Click on Next. 9. For the purpose of exploring a new map visualization, select Bubble Map and click on Next. 10. Choose DST_Analytical_UK_D as the analytical dataset and click on Next. 11. Select NAME_2 as the matching field for both spatial and analytical datasets and click on Next. 12. Select the checkbox for Use bubble sizes to visualize data and choose the Data Field as [Sum(Sales)]. Click on Finish. 13. Now you can preview the report and see the result. 1. Open the 2 Report from SQL Spatial report and add a new dataset, DST_RP_Country with the query given below. 2. Add a new report parameter, RP_Country with available values from the DST_RP_Country dataset. 5. It would be good idea to add a Bing Map layer to the background so that we can understand the location better. For this, click on the polygon layer to display the Map Layers panel on the right hand side. Then click on the Add Layer icon and select the Tile Layer option from it. 6. Click on Preview and you can see that the map changes with the selected parameter value. This section will provide details on how you can implement the drill down feature in map reports. For the same, we will be making use of the two reports that we have already created – 1 Report from Shapefiles as the parent report and 2 Report from SQL Spatial as the child report. 1. Open the report – 1 Report from Shapefiles in design mode and click on map report item to bring the Map Layers panel on the right hand side. 2. Right click on the polygon layer and select the Polygon Properties. 3. Select the Action tab on the property popup window, and select the Go to Report radio button. 4. Specify the 2 Report from SQL Spatial report as the child report and map the RP_Country parameter with the Country field as shown in the image below. Then click on OK.
5. Once this is done, you can preview the report and see that the second report gets displayed with the appropriate filtered data on clicking a particular country in the first report. Just like we aggregate our normal relational data, there might be scenarios where we would like to aggregate spatial data and display it in a report. An example would be to aggregate custom sales regions of an organization at a country level. This example would take you through such a similar implementation. 1. Create a new table dbo.GBR_adm1 with spatial data which corresponds to the shapefile GBR_adm1 in the samples. 2. Add a new column called Sales_Region to the table dbo.GBR_adm1 and give a value of North to Scotland and Ireland, and South to England and Wales. Note that geography::UnionAggregate and geometry::UnionAggregate are two new spatial functions introduced in SQL Server 2012 to aggregate geography and geometry data respectively. The same effect can also be done by aggregating the spatial data in the reports instead of in the query. 2. Create a Basic Map report with this dataset as the source. 3. Click on the map viewport to bring the Map Layers panel on the right. Click on the polygon layer, and then press F4 to bring the property panel. 5. Click on the Group property and add the SalesRegion field as shown in the image below. Click on OK.
6. Preview the report now and you should see the map of UK aggregated by SalesRegion as in the example above. 1) All of my map reports are visualized in a single color even when I have not chosen the Basic Map option. Why is that? 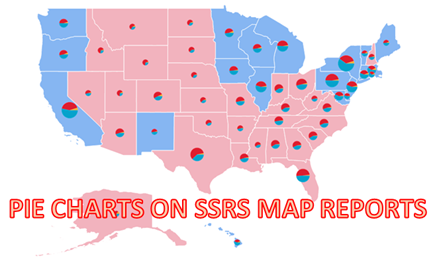 SSRS has some color distribution options which govern the way colors are visualized in your map reports. By default, it is kept to Optimal option which create ranges that automatically adjust distribution to create balanced sub ranges. You might want to change it to EqualInterval option (which creates ranges that divide the data into equal range intervals), EqualDistribution option (which creates ranges that divide that data so that each range has an equal number of items) or Custom option (where you can specify your own number of ranges to control the distribution of values). This can be done by right clicking on the map layer and selecting Layer Color Rule option. 2) How do I import my shapefiles to SQL Server? Currently, SQL Server does not have a built-in option to import shapefile data to SQL Server. One of the most popular ways to import shapefile data to SQL Server is by using the free tool Shape2SQL. This has a single screen, easy to use GUI and can be downloaded from http://tinyurl.com/Shape2Sql. 3) How do I add my own custom locations as a point layer in map reports? 4) Can I create my own custom shapes in the map reports? The query is available in http://tinyurl.com/SpatialLogo if you want to have a further look. 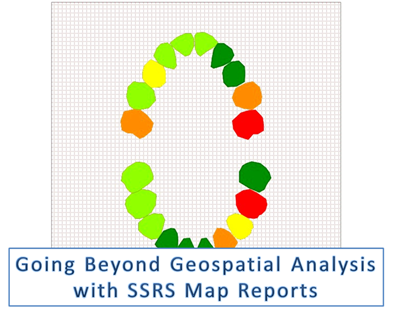 Conclusion SSRS spatial features take up the charting possibilities to a whole new level. In addition to the normal geo-spatial reporting capabilities, we can also use the spatial features to basically create any shape or chart that we require and visualize it with data. All we need are the locations of the shape as well as a little bit of creativity. Throughout my childhood, I have always been fascinated by the idea of maps. It could be attributed to the number of pirate and treasure hunter stories that I used to voraciously devour. My dreams were filled with the protagonists in those books and their endless struggles to decipher the coded information in the maps. What used to strike me was that the location of the treasure was always present in the maps but still countless men were misled by them. Most of the times, it took the right person or the right context to get to the bottom of the map. As I grew older, my association with pirate / treasure hunter stories decreased (apart from watching the occasional Pirates of the Caribbean releases) but my bond with maps just went on getting stronger. Though my friends might joke that the reason for this is because I am so spatially disoriented (I still use a navigation system to travel from my home to the office which is just a mile away for fear of getting lost), the real rationale is because I see a lot of value in geospatial analytics as a BI consultant. In today’s world, when more and more product companies are bringing forth tools to easily analyse location based data, the excuses for not trying to analyse and explore geographic patterns in your business data are running dry. The Microsoft BI platform has a very able set of tools for geospatial analysis which includes SQL Server Reporting Services, Power View and Geo Flow (this is without including some of the map apps that are present in Office 2013) and helps me a lot in evangelizing geospatial analytics amongst my clients. While I was reading the news, I came to know that the last week was the 200th birth anniversary of one of the pioneers of geospatial analysis as well as the father of modern epidemiology – John Snow. 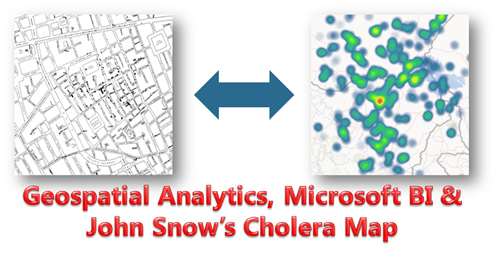 I decided to pay my homage to him by following his adventure and reproducing his famous 1854 Broad Street Cholera Outbreak map using Microsoft BI. The first section of most treasure hunter stories weave through the part where the protagonist goes through shady alleys and dilapidated shops to find the treasure map from some ancient hawker. Likewise, John Snow might have gone through the disease laden streets to pick up the statistics on the cholera deaths and their locations. Luckily for me, I just had to search the internet and got the data (thanks to Robin Wilson). You can download a copy of the data from here. I did some simple changes to the source data to extract the longitude and the latitude columns from the geometry column as shown below (pro tip: use the Flash Fill feature of Excel 2013). The plot continues where the protagonist tries to make sense out of the map. Treasure maps are never straightforward and he takes a lot of time to see whether there are any hidden clues or markers in the map. Similarly, John Snow must have spent a lot of time studying the statistics as well as exploring the data visually for geographic patterns. I decided to visualize the data using Power View initially to check for any patterns. Just as the protagonist tries different approaches, I decided to also use GeoFlow to visualize the same data. The heatmap visualization in GeoFlow indicated something that Power View didn’t show that explicitly – unusually large number of deaths around the red area. This is one of the most crucial part of the story, where the protagonist tries to cross check and re-validate the patterns or code that he has found within the map. This is what is going to distinguish him from the countless men that have lost their lives in search of the treasure. He makes sure that the clues that he has got from the map is not a red-herring. This is what John Snow did too, as is his evident from his writings – “On proceeding to the spot, I found that nearly all the deaths had taken place within a short distance of the [Broad Street] pump. There were only ten deaths in houses situated decidedly nearer to another street-pump. In five of these cases the families of the deceased persons informed me that they always sent to the pump in Broad Street, as they preferred the water to that of the pumps which were nearer. In three other cases, the deceased were children who went to school near the pump in Broad Street… With regard to the deaths occurring in the locality belonging to the pump, there were 61 instances in which I was informed that the deceased persons used to drink the pump water from Broad Street, either constantly or occasionally…”. As for all of us, we already know the cause and hence all I had to do currently was to display the pumps also as another layer in GeoFlow and to see the correlation of deaths and proximity of pump. Isn’t it amazing to see how accurately GeoFlow has plotted the problem causing Broad Street pump right in the area of the maximum deaths! This is the final part of the story where the protagonist undertakes the arduous journey to find (and hopefully claims) the treasure. The journey is not easy and there are every chance that he might be misled like the countless many before him. Similarly, in geospatial analysis, it is very easy to get carried away and share wrong results. However, John Snow’s map (shown below) was very instrumental in convincing the London authorities to shut down the problem causing Broad Street Pump and history says that this helped in containing the outbreak. If done correctly, geospatial analysis is extremely powerful and with technologies like Power View and GeoFlow, this can be done pretty easily and quickly. If you are interested in geospatial analysis or Business Analytics in general, it’s still not late to register for the PASS BA Conference happening on Apr 10-12, 2013. And if you do register, don’t forget to attend my session on GeoSpatial Analytics using Microsoft BI. You can download the completed Excel 2013 file with the Power View and GeoFlow visualizations from here. I have been playing around for a couple of weeks with the beta release of Excel GeoFlow and I have got very mixed feelings about the product. No, I am not trying to be the Grinch in this Christmas season and I must say that I sure do like the direction in which Microsoft and this product is going – just that it is not even half as ready as I would have expected (but to be fair to them, it is just the beta 1 release). That said, there are a couple of features that I am really excited about and I thought of jotting down a quick introduction to GeoFlow for those who are interested. If you would like to try GeoFlow, send a mail to geoflowbetarequest@microsoft.com and wait for the team to respond. You must have Excel 2013 for GeoFlow to work. – Related tables are not supported in this release.All the data should be in one table. – Backend data changes are not reflected in the visualization in this release and this will mean deleting and recreating the visualizations. – No Undo/Redo is supported in this release. – No drill down functionalities from a higher level (say, states) to a lower level (say, counties) which is there in tools like Power View. a) After installing GeoFlow, you should now be able to see the 3D Map button in the Insert tab. Click on any of the cell within the data table and then select the 3D Map button within the Insert tab. Click on the Explore in 3D option as shown in the image below. b) Choose the geographical field based on which you need the map. In my case, it is the StateName field. Click on Map It button to proceed. c) Click on the Population field to see the states visualized by this measure. By default, you have got the Column chart visualization (which can be clustered or stacked if a category is present). This can be changed to a bubble map or a heat map visualization also. · Double click rapidly on any portion in the globe to zoom closer to it. · Use the scroll wheel on your mouse to zoom in and zoom out. · Click and drag the globe in any direction to pan without changing the pitch. · Hold the Alt key, and then click and drag to change the pitch. · Tap the arrow keys up, down, left and right to pan and spin the globe. · Hold the Alt key and then tap the left and right arrow keys to orbit the current target, or the up and down arrow keys to increase and decrease the camera pitch. · Tap the plus (+) and minus (-) keys to zoom in and out. a) Handles multiple geographical levels:- We can add multiple geographical levels to GeoFlow. To add the counties (AreaName field) to our basic report, click on the Edit button in the Layer Manager as shown below. Then select the AreaName field and map it to the County in Geography section. Then click on Map It button. Now you should see the map visualized by counties. It might take some time for all the data to be processed on the map and it depends on the number of rows that you have. When the processing is done, you should see the message as Finished in the green bar below the map. You can easily toggle back to the states by selecting the StateName radio button in the Map by section. However, as I mentioned before, drill downs are not possible (as far as I know in this release). Vote to up this request in Connect by clicking here. b) Visualizing Data over time:- We can visualize the data over time if we have a date or time field. In my dataset, I have the year but this is not enough as GeoFlow requires a date or time field. So I had to make a new filed called DateYr which converts the year to a date field by adding 1/1/ before every year. Vote here to up this request to have the time play axis use any level of the time dimension. Now in GeoFlow, drag and drop the DateYr field to the Time section. Now you will get an additional section for time settings which has values like Time Accumulation, Instant and Persist the last. You can also see the time play axis on the bottom. Click on play and you can see the data changing over time. c) Adding Annotations and Textboxes:- This is definitely one of my favourite features. We can now add an annotation to a particular data-point by right clicking on it and then selecting the Add annotation option. Similarly, you can add a textbox also. The only difference between them is that an annotation is bound to a data point while the textbox is more like a sticky note on the screen. The textbox stays at the same position even when the map is panned or zoomed. d) Find a Location:- The find a location feature is pretty handy in case you have a lot of data points and want to directly zoom to a particular location. e) Creating and Saving Tours:- I have obviously saved the most exciting feature for the last. Now you can create tours by clicking on the New Tour button and then including the scenes in the tour by selecting the Capture Scene button. Scenes will transition automatically and effects are automatically applied. A scene is auto-saved when you capture a new scene. If you want to change a scene, for example if you want the scene to show a different angle or a different time subset, select the scene, make the changes and then click on Save Scene, Once you have created a tour, you can play it by selecting the Play Tour button. I have posted a video of a sample tour that I created. After creating a tour in GeoFlow, the tour is automatically saved back to your workbook. You can create multiple tours by clicking on New Tour. Saving your Excel workbook will save each of the GeoFlow tours you created with the worksheet it was created from. Now you will be able to see a new option to Manage Tours also. To summarize, there are some exciting features but clearly, a lot of work needs to be done before it can be used by data professionals for analysis. With this, we come to the end of today’s post. Wishing all of you a very Merry Christmas from my side and be good! There has been a lot of buzz in the BI community since yesterday, and the reason is none other than the public preview of Office 2013 (Excel 2013 in particular). There’s been a lot of articles written on the new features available and the integration of PowerPivot and Power View has really got everyone talking about. In case you still haven’t looked at the new features, here is the link for it. Meanwhile I can’t wait to blog about the spatial capabilities available in Power View, so I am directly jumping to the topic. 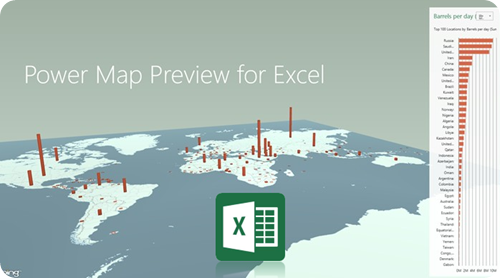 Power View in Excel 2013 has the ability to create maps from your data and uses Bing maps for the same. Unlike the maps in SSRS, here you do have the ability to zoom and pan as needed. Also, Bing maps automatically detects the location and hence you don’t need to provide a shapefile or even the latitude/longitude information. 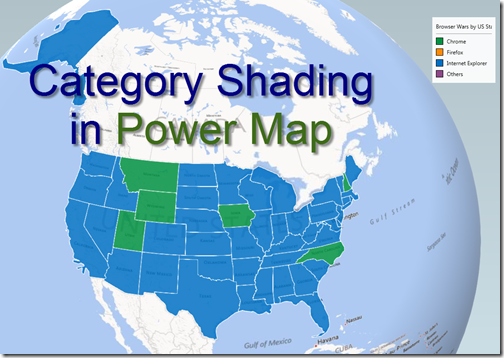 In this blog, I will take you through the steps to create a map report in Power View. 2) Select the entire data, go to the Insert tab and click on Power View icon. You should get a warning to enable content as the data needs to be sent to Bing to get geocoded. Click on enable content to proceed. Note that you would need an internet connection for implementing this. 4) Now you can pretty much rearrange your fields by dragging them into the areas below. I have dragged Sales into the Size, City into Locations as well as Color. So I get a map report below which shows the cities as bubbles with corresponding colors and size as the amount of sales. 5) You can also play around with other properties like Title, Legend, Data Labels and Map Background. They are present when you click on the Layout tab. It is interesting to note that the data used for creating the Power View report gets imported into PowerPivot by default. This is because Power View can only communicate through DAX currently, and hence needs a tabular model behind it. The PowerPivot model can be viewed by clicking on the PowerPivot tab and then selecting the manage tab. Since there is no way to add additional data into this model without deleting and recreating the table, it would be a good practice to create the PowerPivot model first from linked tables, and then using the PowerPivot fields to create the Power View report. This way, we will be able to keep on adding data as long as there is a link between the table and PowerPivot. I will be showing you how to do this in the next part. 1) Select the same set of data in excel, go to the PowerPivot tab and select the Add to Data Model icon as shown below. Note that you can still create Power View reports directly, but we will be using this technique for the reasons mentioned above earlier. 2) Select the home tab, then click on Pivot table option and select Power View to create Power View report. It is recommended to set the reporting properties of the Country and City field, so that Power View can recognize them as geographical entities, as shown in the image below. 4) Now click on the Country field, and then you should be able to see the Map icon appear on the menu above. Click on the Map and then drag both the country and city fields within locations. You can also put the Sales measure in the Size area. Now you should have a map report which drills down from the Country level to the city. If you double click on the blue dot in the center (which is USA), you will get the drill down report by cities. Notice that the title has automatically changed from Sales by Country to Sales by City. You can also click on the up arrow (highlighted in the image below) to return to the parent report. 1) Use the previous report, and then add the city to the Color area. Now you can see that there is a pie chart by cities at a country level. Similarly, you can use the Tile By option also (however, this feature is not available if you use the multiples option) Another best practice is to concatenate your city names with state/country info also (as I have done in all the examples) as there might be duplicate city names and doing this will help Bing in geocoding it better. You can also do this operation as a calculated column in PowerPivot, if you don’t want the city names to be displayed with their country/region info appended. I used the site http://www.findlatitudeandlongitude.com/batch-geocode/ to get the latitude and longitude of the address. 2) Now select the data and use that to insert a Power View report. Click on the City field and then select the Map option. Now the latitude and longitude would be mapped to the corresponding columns if the names are the same (else you can always drag and drop them) and your map report would be ready. 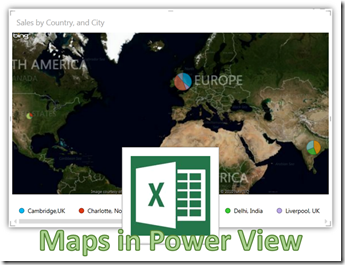 Hopefully this post has given you a good start to start playing with your own map reports in Power View. There are again a lot of best practices embedded within the post and sorry for not doing a great job of consolidating them, but I am hoping that this will serve as an incentive for you to read this long post completely. And well, if you have not yet downloaded the office preview, do it now from this link.